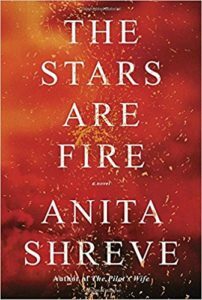 About 3/4 of the way through Anita Shreve’s latest novel, The Stars Are Fire, I lost my mind. I was listening the book on audio, without the print to go back and forth to, and I was at a point of such tension and suspense that I simply could not stop listening. The only problem is that I didn’t have the audio on my phone – only on CD – and I had no opportunity to listen to the CDs over the weekend. PANIC! How was I going to get my fix? So here’s why I was so invested. The Stars Are Fire is about Grace, a woman in her early 20s, who is married to a gruff, unaffectionate man. The setting is Maine in 1947, and with two children and no means to support herself, Grace is trapped in her marriage. She knows that she is unhappy, but has little recourse. Then one fall, a massive fire spreads through the drought-stricken coast, and Grace’s house burns to the ground. She manages to escape and saves her children’s lives by escaping to the beach and shielding them in a boat. Gene, meanwhile, who was working further inland to prevent the fire’s spread, disappears after their town is destroyed. With her husband gone and her house destroyed, Grace must figure out how to provide shelter and an income for her family. The Stars Are Fire is about Grace’s emerging independence and confidence, at a time when women had few freedoms. There is also the ever-present uncertainty surrounding Gene’s whereabouts and the possibility of his reappearance. Other characters come and go, some affecting Grace more than others, which bring additional dimensions to the story. I’ve long been a fan of Shreve’s. She’s an expert storyteller with a gift for building suspense and keeping her reader interested. I HAD to know what happened to Grace, and was distracted and frustrated until I could find out. The Stars Are Fire is not a perfect book. The end is a bit tidy, given all the buildup, and some key twists were unrealistic or too convenient. But who cares? This was a thoroughly immersive, engrossing book and I will not soon forget it. As I mentioned, I listened to The Stars Are Fire on audio. I thought the narration by Suzanne Elise Freeman was just OK. Her delivery was a little robotic, and she made Grace harsher and more aggressive than I suspect Shreve intended. But again, I didn’t care! I just wanted to finish it. I just recommend also having the print version or ebook if you’re going to listen to this book on audio, because you will want it! Posted on June 15, 2017 by gayle. This entry was posted in Audiobooks, Fiction and tagged anita shreve, audiobook, the stars are fire. Bookmark the permalink. I have this book in a to-read pile. I’m glad to hear I’ll enjoy it. I agree w you on the ending… seemed out of character in general. I could see it as a movie! I like your review, Gayle. I thought the narration for Grace was very nicely done; I didn’t like the voice that the narrator used for each of the male characters. That didn’t bother me, though it certainly didn’t help Gene’s overall demeanor!